Yesterday, I asked if you could spot my mistake in sign design for my DexCon demo table. While designing the signs on my computer and picking them up from the printer, I was looking at them from the perspective of someone focused on them. I wasn't looking at them from the perspective of someone at a busy convention. Because of this, I didn't realize that the sign which actually said "City Hall", would become background noise and not be noticed at all. Whereas the "You for Mayor" sign had large, high-contrast text and bright, inviting colors that drew the passing eye towards the table, the "City Hall" sign had muted colors and text that blended into the already busy image. If you stopped to look at that sign, it was clear, but you had to know to look. 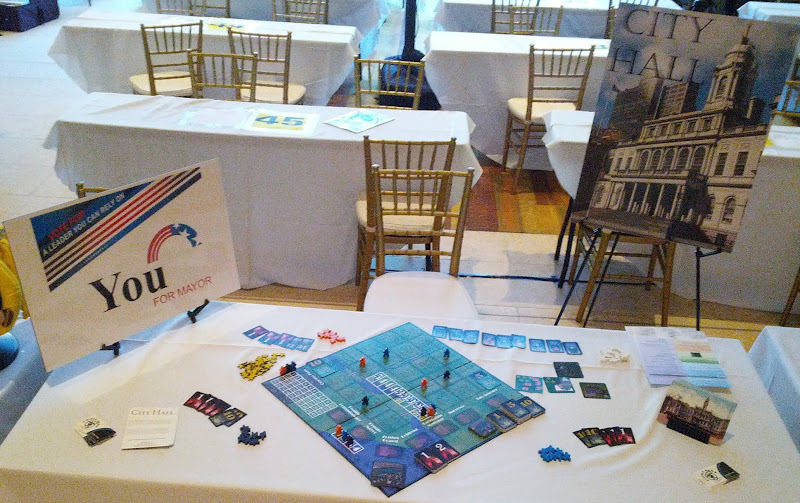 Furthermore, while the "You for Mayor" sign was extremely effective at drawing people over to the booth, nowhere on it did I put the name of the game. A couple of people even thought that "You for Mayor" was the name of the game. So, that lesson is learned. For the next convention, I will have a single colorful, high-contrast sign with the game's name on it. It may not be as elegant, but it will be more effective at drawing people in and making the name of the game stick in their heads.